Here's my entry. Feel free to give it whirl. I'll try to be spoiler-free as much as possible if you want to keep the "surprise" of the game as surprise-y as possible. I've been wanting to do something interesting with the mini-book format for a while, and a choose-your-own-adventure system seemed like a good fit for it...especially since the mini-book format dovetails perfectly into the one-page design requirements of trying to fit a dungeon on to one side of one page of paper. 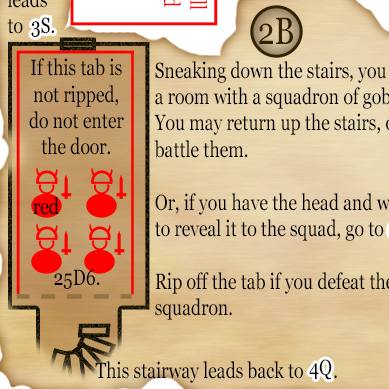 The fun thing in this design is in the use of ripping tabs off the paper as a way to denote status changes in the dungeon. This allows for a little back-and-forth into the same areas, but with different effects. As usual, I continue to be interested in the mechanical aspect of hiding and obfuscating linked information by way of windows on cards when placed on one another (as I've talked about before). And, again, the minibook format became a fun playground to mess around with that idea. There's quite a few layering tricks employed in this book with regards to revealing and hiding information. Having done this the first time, I'm sort of looking forward to trying it again from scratch to see what other nonsense the format could pull off. As far as the dungeon itself is concerned, it's naturally quite small. There's only so much room you can fit on a sheet of paper while handling the status changes within the game. However, I'm pretty pleased with the amount of "weight" the story. Given how little information is given with regards to the story, I think that there's enough of a twist to make you think about your given mission. Play-wise, the game has a very distilled and raw resolution system, tied to two different colors of dice. (The dice are also used as a way to track you health, yay for dual purpose components! )The main decisions that the player will make will involve deciding which color set of dice to roll during combat. Initially, both color sets were balanced with the exact same rules (a die's color is more powerful against an obstacle it's same color), which became a very simple mathematical enterprise to determine which color set to use. In this version, the color types are rather unbalanced...which adds a little bit more thinkiness when determining your course of action when going into battle. And again, there's really not much to battle, given the size and scope. And the game is balanced enough to make sure that you will win more than lose...if you really have a desire to play it more than once. I would probably work in a couple of extra colors of dice for more choices....but hey, it works right now for a first pass at an idea. *edit* link for the file now goes to the RGPGeek entry. Gah ... wow. One of my favorites from this contest.